Yannick Alléno, a man with six Michelin stars under his belt, has brought to Central’s Prince’s Building a branch of his French bistro, Terroir Parisien. Given Alléno’s reputation, our expectations are high – too high, as it turns out. The menu, stuffed with various different sets and happy hours, is filled with classic French dishes but, despite being touted as the quintessential Parisian bistro, Terroir’s decor is surprisingly modern and unremarkable. Once we finish deciphering the overloaded menu, we order onion soup with comté cheese and croutons ($118) to start. Aware we are sharing, the staff, though skittish, are friendly and ask if we’d like the serving split in two. Once the scalding dish cools, we sip on the rich broth. It’s a little too beefy, despite a satisfying stringiness from the cheese, and we wish there was more tartness from the onions. 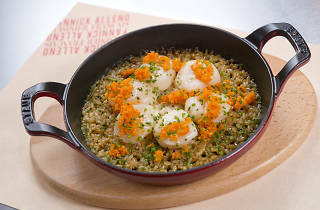 For our mains, we order sea scallops cooked over a simmered rice pilaf in an aromatic broth with fresh herbs ($288) and Christian Parra’s black pudding and soft potato purée cooked French style ($248). The hefty price tags reflect the large portions, which come served in Staub skillets. There’s something horribly dated about the presentation of both dishes and not in a quaint way. 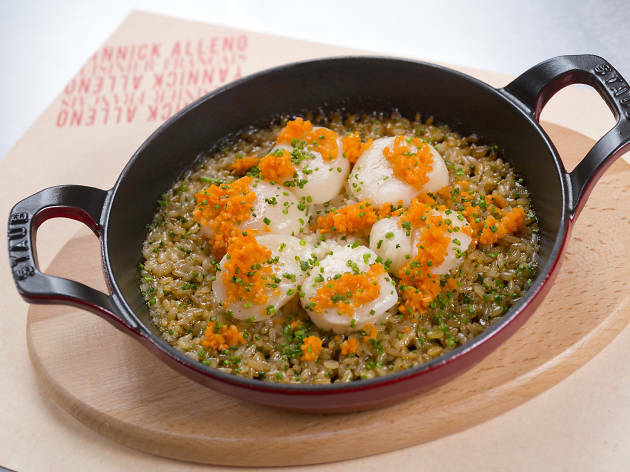 The scallops are off-puttingly topped with diced carrot – making them look like devilled eggs – and any flavour the bivalves may bare is drowned out by the aromatic rice. It’s not awful but we want scallops, not a plate of stock saturated rice and bland rubber discs. Seeing as the black pudding is imported from Paris and made by legendary French chef Christian Parra himself, we anticipate big things. We’re a little miffed then when the overly soft slab of pudding turns out to lack depth, texture and the heavy potency a good black pudding should have. The potato purée is creamy and, like the rice with the scallops, it dominates the main component of the dish. For dessert, the baba au Grand Marnier with vanilla cream ($88) is pleasant but it’s more lemon cake than indulgently boozy flaming dessert. Oh well. Though Terroir Parisien isn’t terrible, we feel this Parisian import relies too much on Alléno’s good name without delivering the quality of the original.